When my mother found a climbing frame petite enough for our cosy garden we were over the moon. Once it was constructed and looking like a crazy green spaceship had landed on the lawn I was a little worried but as soon as my then 23 month old daughter eagerly clambered to the top I knew it was a great choice. The dome shape makes it very sturdy while the triangular sections provide easy foot holds. It is light weight enough to be moved when necessary. 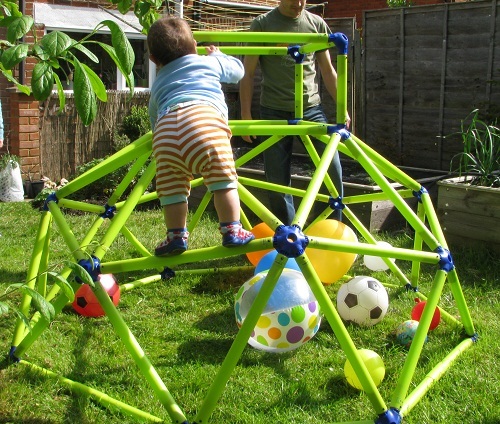 The climbing frame comes flat packed and requires construction (two adults, one toddler – under an hour). It can be dismantled and reconstructed twice (not sure why it’s only twice). We bought ours from Sainsbury’s and by the end of last summer they were heavily discounted. I have found it online at Argos for Â£79.99.